I just finished reading the book Into The Wild which is book number 1 in the Warriors: The Prophecies Begin series of books. These books are actually written for 8 to 12 year olds but I have to tell you they are just as enjoyable for us old adults to read, too; especially if you happen to love cats. I plan to read through the rest of the series and then the additional series that were written after this one began in 2009. Erin Hunter intrigued me with her descriptions of cat behavior throughout this book. She made me giggle, saw "Ahhh" and become attached to several of the cats in the story. The story begins with Rusty a pet cat in an undetermined neighborhood. Rusty is dreaming of catching a mouse in the woods and then is disappointed when he awakes to find that he is still in the home of his owners and is forced to eat the dry kibble and drink the bitter tasting water in his food and water bowl. He much prefers the taste of the water found outdoors in the puddles and has never caught a mouse in his young life. Rusty goes through the cat door and visits with the neighbor cat, Smudge. They sit on the fence and look toward the woods and wonder what life would be like out there. Smudge has no desire to go to those woods because he has heard there are wild cats out there that would just as soon beat you up as to look at you. Rusty is yearning for adventure, though. He jumps from the fence and walks toward the woods and there is where the adventure begins. He sees something moving in the darkness and begins to stalk it. He knows it is too big for a mouse and it has a red tail. As he goes further into the forest, he gets attacked by a very large and very strong cat. Rusty holds his own in the fight and finally the fight stops. He discovers that he is surrounded by a group of wild cats. One voices his distaste for the stench of "kittypet" he is throwing off while another makes fun of his small size. The cat who fought with him tells Rusty that he should be proud of his fighting skills, although they are still undeveloped he did have some interesting moves. In the course of the conversation, Rusty is invited to come join the ThunderClan of wild cats and has until the next day at noon to give his answer. As you might have already guessed from the title, Rusty decides to leave his comfortable home with the Twolegs (what the wild cats call humans) and live with the forest cats and become a warrior. This is a book that I would recommend for a child to read along with my adult friends who love to read. What I love about it is that there are such wonderful messages given to children about courage and social skills. Just as with humans, the cats have a system of authority which is sometimes not respected very well. There are bullies and there are heroes. There is even one part where the message is that we should respect the wisdom of our elders and that just because one is old does not mean that they can't offer valuable assistance to the group. The messages are disguised in the adventures of the cats but they are there just the same. I love how Erin Hunter describes the body language of the cats in such perfect detail. She has obviously lived with more than one cat in her lifetime! This was a sweet book, an exciting read and an enjoyable way to spend a few days of my time. I think that any child would love to have it read to them or to read it themselves. It is a book that I would have loved to read to my daughters at our nightly reading ritual when they were small. It is a book that I will most certainly give to my oldest grandchild and will enjoy reading to my youngest. OK, you've captured my heart with Into the Wild. Being an animal lover and sharing my home with 2 cats, I know I would love the story of Rusty. Plus, I have several granddaughters who would love for me to read this to them. What a special book and a series to boot. The Warrior series will be a great one for me. Thanks for the wonderful review. What a great review! This sounds like such a wonderful book series for all animal lovers. I know my children would love it, especially the mother of my 3 grandkitties. I've been a cat lover all my life, so find this review of Into the Wild intriguing. Love reading stories from an animal's point of view. And, combined with life lessons, this sounds like a wonderful series of books for children. 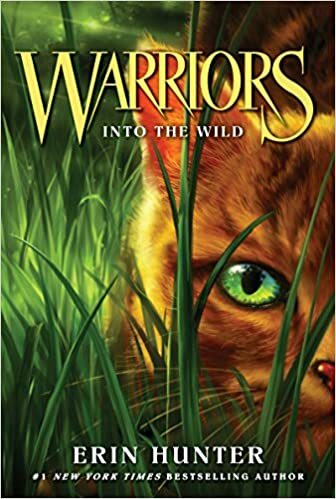 Bev, I've now had an occasion to learn more about Into the Wild and the Warrior cats series of books as my teenage grandson introduced them to me this summer on a visit to 'grandma's house'. :) I've linked my review of the Warrior series to this, your review of "Into the Wild".